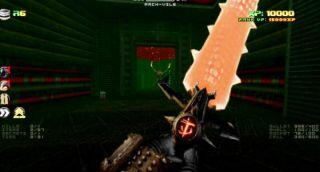 What if Doom Eternal was made in 1994? It's going to be a while until we get to murder demons in new and gruesome ways in Doom Eternal, but we can still play with a lot of the new toys thanks to some hard-working Doom 2 modders. Doom Eternal XP collects and modifies a bunch of these weapons and mechanics in one handy mod, and it's got a lot of additional features, too. The mod's creator, Officer_D, initially made an experience-giving mod, but when Doom Eternal was revealed last year, they started to hunt down assets and resources that the community had already designed and put them together. Doom XP was quickly renamed Doom Eternal XP, and since then it's enjoyed regular updates and bug fixes. Even the dodge mechanic has been recreated. While Doom's longevity owes a lot to mods, there's no guarantee Doom Eternal will have any mod support, and it definitely won't at launch. It's a shame, but we'll always have the old ones. Doom will outlast us all. The mod's been in development since last year and was last updated just a few days ago. Download it from ModDB.